Clinical research is fundamental to finding new treatments to improve patient therapies, and increase survival rates in cancer care. A career in research nursing in cancer services is humbling and inspiring. Research nurses play a pivotal part in clinical delivery, care management and act as a patient advocate in an often complex and highly emotionally challenging patient journey. They work with people who, in many cases, have volunteered what precious time they have left to improve future care. Research roles also offer nurses the opportunity to work at the cutting edge of science and develop their clinical practice. 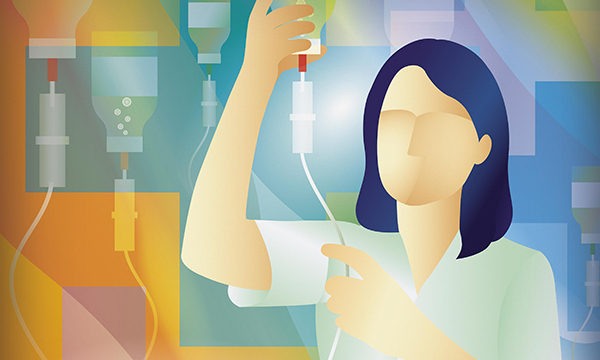 Misconceptions among nurse graduates and nurses working in cancer care about what the research role entails had a detrimental effect on the future research nurse workforce and slowed the rate of development in patient care and cancer survival rates. As a senior Cancer Research UK nurse for Newcastle, I raise awareness and understanding of clinical research. I am also involved in driving innovation in research delivery to support the changing nature of trial design and emerging cancer treatments. During a recent meeting of the Experimental Cancer Medicine Centre (ECMC) National Nursing Steering Group, of which I am a member, we explored national concerns about nursing recruitment and the factors affecting enrolment to clinical research nursing posts. We discussed how research nurses believe they ‘fell’ into research nursing posts, rather than it being a genuine career aspiration (Boulton and Beer 2018). As a group we agreed to develop a strategy to find ways to highlight the role of research nurses in cancer. In May last year, I approached a local university and offered to give some talks on the role of a research nurse in cancer. A few months later, I gave a one-hour lecture on the role of a research nurse in early and late phase cancer clinical trials at two conferences for Teesside University nursing students. In addition to highlighting the role of a research nurse, the lectures included information about the Newcastle ECMC and cancer patients’ pathways into clinical trials. The presentations described fully a patient's journey from standard care to clinical trials and the important role a research nurse plays in this process. The lectures highlighted that a nurse working in clinical trials uses an array of transferable skills and knowledge gained from their nurse training and in cancer research this is essentially a clinical role. What is your understanding of the role of a research nurse? What is your understanding of local cancer research? Would you consider a research nurse post on graduating? Students completed the same questionnaire after the lecture. The questionnaire was completed in full by 384 students; 216 students were starting their second year of a nursing degree and 168 students were starting the final year. Before the lecture, 75% of students had no idea what the role of a research nurse was. Of the 25% students who said they did know what the role entailed, most thought it was non-clinical, academic, was about auditing or being involved in developing evidence-based practice. Only 11% of students said they would consider a research nurse post on graduation. After the lecture the data suggested that the session had a positive effect on students’ responses, with 99.7% indicating that they knew what the role of a research nurse was. Furthermore, most students were now seeing the job as a clinical role as opposed to a non-clinical role, and 63% of students would consider a research nurse post on graduating, based on their new understanding of the role. There were next to no differences in students’ responses across the two cohorts. The main difference was seen in the answers to the post-lecture question around considering a role as a research nurse on graduation; 10% of final-year students and 6% of second-year students answered that they were undecided. All the basic nursing knowledge and skills you learn as a student come into play when working as a cancer research nurse. It is a clinical role; you may have fewer patients than if you were working on a ward, but you are just as busy. The role involves managing the care of patients through an often complex and emotional journey, developing specialist skills and knowledge that allows you to deliver and monitor experimental treatments safely, and you are central to the generation of new knowledge around cancer treatments. This new awareness of the role was a pivotal factor in the rise in the number of students who would consider a role as a research nurse. The lectures made students aware of an area and a methodology of work that they previously had little knowledge of. The findings from this pilot project provide a glimpse of the recruitment issues facing cancer research. A lack of understanding and misconceptions of what a research nurse contribute to why the role is not seen as a tangible career option. Educational interventions offer an opportunity to give our future and current nursing workforce an insight into what the role entails, removing preconceived ideas and giving clarity. Developing this awareness will enable research nursing to be viewed as a viable career pathway rather than something nurse graduates fall into. Developing this pilot project further could bridge a gap in the understanding of what the role comprises. This work could easily be adopted by universities and hospital trusts across the UK to highlight the role of a research nurse in cancer. Potentially this could have a positive effect on recruitment to research nurse posts in cancer care and ultimately continue the positive advances in cancer care and treatments to which nurses are central.